a rich and beautiful natural setting." on the edge. . . . An exhilarating survivalist adventure." Thirteen-year-old Karma is lost in the backcountry of Montana with her falcon, Stark, and a troubled runaway boy named Cooper. She's desperate to find help for her dad and brother after they find themselves in a terrible accident on a back road. Karma wouldn't be in this predicament if her parents hadn't insisted on returning Stark to the bird's original owner. Karma's dreams of becoming an apprentice falconer will never be the same when she has to give Stark back. 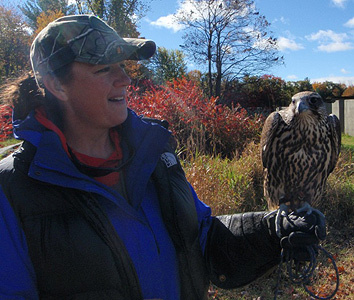 Lost in the wild, her bond with the tamed falcon only grows stronger. All the while, Cooper gets his own lessons on how to trust in newfound friendship. Both Karma's and Cooper's mettle is tested by mountain terrain, wild animals, severe weather, injury, and her own waning hope as this edge-of-your-seat wilderness adventure story vividly portrays the special bonds that can form between humans and animals. "This book is an adventurous coming of age tale with a rich and beautiful natural setting. The imagery of the woods and country will make readers feel as if they are journeying alongside the protagonist. The details about the birds and what it takes to survive in the mountains are enlightening. 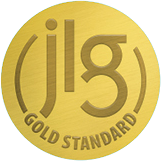 Verdict: A strong choice for middle grade readers who appreciate nature, animals, and survival stories; an accessible read that could also spark discussions within a classroom setting." "Riveting action and harrowing experiences keep readers on the edge as the kids and falcon race to get back to Karma’s father and brother before it’s too late. . . . An exhilarating survivalist adventure." 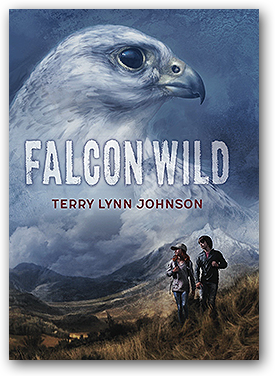 "In Terry Lynn Johnson's Falcon Wild, 13-year-old Karma is lost in the Montana wilderness with her falcon, Stark, and a runaway boy, looking for help for her dad and brother who have been in an accident.... Lost in the wilderness, her bond with the bird only grows stronger as they face wild animals, injury, and severe weather together." 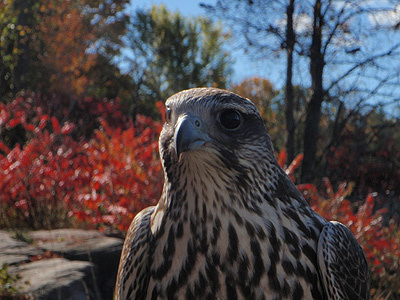 "Falconry is a unique and ancient partnership between human and bird." I gratefully acknowledge the support of the Canada Council for the Arts and the Ontario Arts Council for providing me grants to write this novel.